Almost 200 MILLION global subscribers now own a mobile LTE device and this number will grow to a billion by 2017. While LTE roaming is in its infancy, soon all LTE operators will face the challenge of LTE roaming. 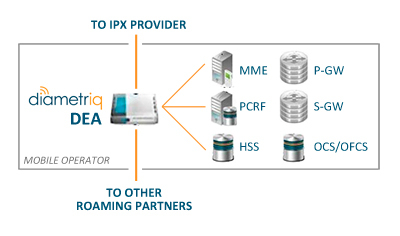 As LTE roaming quickly becomes a reality, there is a need for an edge device (Diameter Edge Agent) to concentrate multiple IP connections between IPX’s and roaming partners as well as to provide security and topology hiding. To handle roaming between 3G and 4G networks an interworking function may be needed. Diametriq has developed the Diameter Edge Appliance™, a cost-effective yet highly reliable Diameter Edge Agent with some unique features. It can include interworking functionality enabling roaming between 3G and 4G networks for both pre-paid and post-paid subscribers. As a software solution, it can be hosted on a number of platforms, embedded in complementary network functions or even virtualized in the cloud. The Diameter Edge Appliance™ is compatible with any vendor’s Diameter Signaling Controller (DSC), allowing easy integration with existing core network infrastructure. It is a cost-effective alternative to upgrading a legacy system or purchasing a new one. We would like to meet with you at BARG 83 to understand your needs for LTE roaming. Further details about our DEA can be viewed here.